SPAIN: Catalan Police Chief Charged With Sedition For "Criminal" Role In Independence Movement [VIDEO] - Joe.My.God. A former head of the Catalan police force who drew widespread praise for his handling of the Barcelona terror attacks in August last year has been charged with belonging to a criminal organisation for his role in the events leading up to Catalonia’s illegal declaration of independence two months later. Josep Lluís Trapero belonged to a “complex and heterogeneous criminal organisation” led by the former Catalan president Carles Puigdemont, the Spanish national court judge Carmen Lamela said in an indictment on Thursday. Trapero also faces charges for public order offences related to the independence declaration in October. 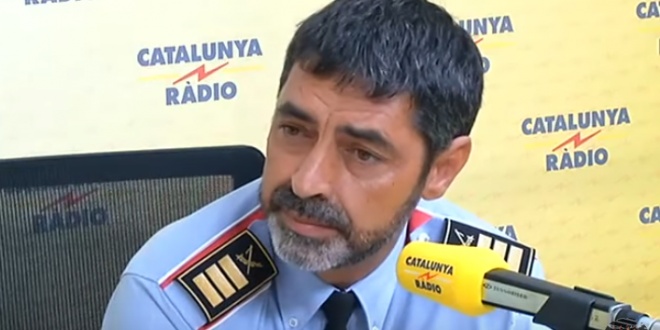 The regional police force, the Mossos d’Esquadra, “shared a common goal of bringing about Catalonia’s secession and the proclamation of a republic, and in this manner changing the political organisation of the state and the government, contrary to the constitution and the statute of autonomy,” Lamela said.